Wash and dry your strawberries. It’s very important that the strawberries be fully dried before you dip them in chocolate, or they will turn out funny looking. You can do this a few different ways, you can either just melt your chocolate, or you can add a bit of shortening or butter as you melt it. The purpose of this is to thin out the chocolate so that it coats your strawberries more efficiently. I tend to always use shortening because it has no real flavor. So in a nut shell I’ll put my chocolate in a bowl/mug along with about a tablespoon of shortening and pop it in the microwave for about 15 seconds. After 15 seconds I’ll stir the chocolate and place it back into the microwave for 15 seconds. 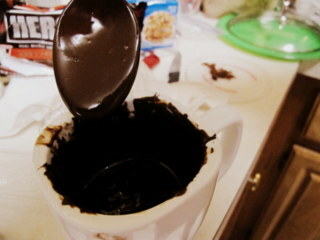 I’ll do this till my chocolate is fully melted and smooth. 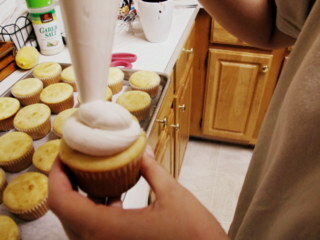 I sometimes continue adding shortening if I feel the chocolate is too thick. 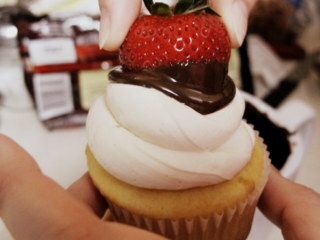 The last step is to take your strawberry and carefully dip the lower half into the chocolate. 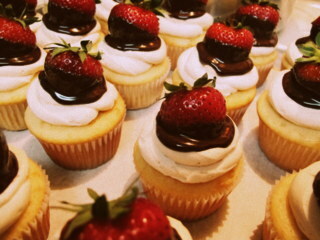 Once dipped, quickly place the strawberry on top of the cupcake and let the excess chocolate run down the frosting. And voilà! 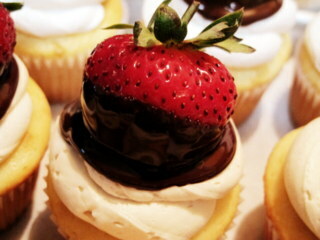 A cute fancy cupcake, that’s delicious and super easy to make : )!